Located just minutes away from the heart of the Las Vegas Strip near the Las Vegas Convention Center, turn of the century elegance is recreated with the spectacular high rise tower, the Metropolis Las Vegas. 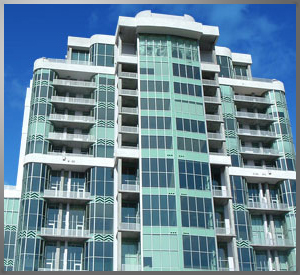 This ultra exclusive building offers the feel of classic Vegas, but the elegance of today in this 18-story art-deco styled high rise. This ultra luxurious high rise offers various floor plans, all with a balcony or terrace, offering a majestic view of the Wynn Golf Club and the Las Vegas strip skyline. Your special event will be held in one of the luxuriously appointed single level flats. This unique apartment features an open floorplan allowing for your guests to mingle throughout the indoor and outdoor space. The home features a state of the art sound system, so inside background music can run classic Las Vegas sounds inside of the residence. During your event, guests will have the opportunity to enjoy the run of the home, including a play room with a Video Game, and the luxurious 2 bedroom, 3 bathroom floorplan. The main living area features (4) plasma screens that can run a DVD of your company logo or any other graphic for branding that you elect. Should you prefer not to brand the screens, a flowing morph of graphics including flowers, abstract shapes, and similar can run. The interior of the home is appointed with modern furniture, decorator enhancements, and fantastic contemporary art. The main feature of the venue is the fabulous outdoor patio. This oversized space offers a fantastic view of the city, and a unique club like atmosphere that is rarely found in a private residence. A secondary patio off of the kitchen area will offer a quiet zone for your guests to converse and enjoy the remarkable view in this exclusive setting. 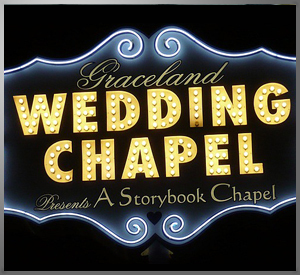 The Graceland Chapel has been a part of the Las Vegas Strip for over 50 years and is one of the most prominent wedding chapels in Las Vegas. Jon Bon Jovi was married here and in 2001, actually held a concert in the parking lot with 75 couples who renewed their vows with him! Other musicians such as Billy Ray Cyrus, Aaron Neville and members of popular groups such as Def Leppard, KISS, Deep Purple and The Thompson Twins have all tied the knot here as well. Jay Leno, a personal friend of the owner, Las Vegas’ own Elvis Tribute Artist Brendan stopped by with plenty of entourage to check out the chapel. It’s been featured in films such as “When Fools Rush In” with Selma Hayek and Matthew Parry; “Fear and Loathing in Las Vegas”, starring Johnny Depp and several television shows such as the CBS Early Show, MTV, VH1, Good Morning America and The Tonight Show. This is a great opportunity for a small group of 40-80 to enjoy a nostalgic piece of Las Vegas History with your exclusive event. There is always something going on at the Fremont Street Experience! Whether it’s the lights, the people or the classic casinos, there’s no shortage of Vegas authenticities or nostalgia here. Fremont Street is Vintage Vegas – where the legend began and the original Las Vegas started. As you stroll the mall, Vegas history – from the days of Bugsy Segal and Benny Binion – comes to life and harmoniously co-exists with the new spirit and energy of the town’s core, which has taken its cue from these pioneers. 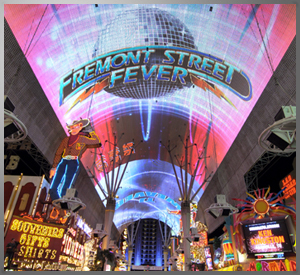 The crowning glory of downtown is the Fremont Street Experience. Completed in 1995, this seven-block open-air pedestrian mall features permanent performance stages, live entertainment and a graphic light show unparalleled for its time. The four-block long 90-foot canopy now features state-of-the-art LED technology that creates a myriad of eye-popping color combinations, while 12.5 million bulbs ramp up resolution to deliver superb picture quality and clarity. Neatly merging past and present, the Fremont Street Experience pedestrian mall created an entirely new environment for Fremont Street! Famous for its fabulous neon, the Fremont Street Experience is also home to some of the most recognizable Las Vegas icons like “Vegas Vic,” which was erected atop the Pioneer Club in 1951. Many other vintage hotel and casino signs, which are part of the larger Neon Museum collection, now dot the pedestrian mall and the courtyard of the adjoining Neonopolis Center. Guests will have an opportunity to mix and mingle under the bright lights of Downtown Las Vegas in fenced off space exclusively for your group and your custom branding and company logo can be shown on the overhead canopy… now THAT is rolling Vegas-style. Perfect for groups from 50 to 5,000! Your guests will be whisked away from the hustle and bustle of the Las Vegas Strip to the home of a prominent local artist. A visit to this extraordinary 9000-square foot residence is not merely a home tour, but a celebration of life. Featured in several national magazines, this intriguing facility is not a museum but its treasures range from the Modernist abstract to folk art. Over her career, our artist has created treasures in almost every medium imaginable including wood, pottery, batik, paper, weaving, and glass. The artist is the author of several books including a cookbook featuring breads and desserts and has also created one-of-a-kind silk designs worn by trendsetters around the world. Her fabrics, wall hangings, upholstery and art animals enhance private collections Internationally. 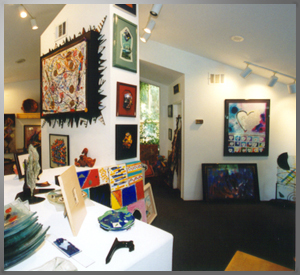 This magnificent home features the artist’s only gallery displaying thousands of exciting examples of creative style, many of which are available for purchase. Maximum Capacity for this venue is 125 guests for a stationed affair using indoor/outdoor space, and 70 guests for an outdoor reception followed by a formal plated meal indoors.